June means heading outdoors and the beer festivals & events head there as well. Vacations are in full swing, brew fests are starting to be in abundance and summer ales are in stock. There are always plenty of drink and food events going on at most Colorado breweries and entertainment venues as well. This page will be updated often as news of upcoming events are announced. Here is a list of the upcoming Colorado beer fests, beer dinners, tapping parties, seminars and related events for June 2012. These listings are updated every week, so stop back often to see the latest happenings with beer in Colorado. Dates and events are subject to change at any time so please check with the event web site before attending. If you know about another event not listed here please add a comment below. The Mayor of Old Town - 632 S. Mason St.
Join the growing number of men who meet each week at The Mayor of Old Town to talk beer and learn about it's history, the styles and how it's made. Select samples from the 100 different beers on tap each week. This free to join Ladies Only club meets every Tuesday at 6pm. They are a grass roots group of women who are interested in learning more about beer, it's history, the flavors and more. Sample from over 100 different beers on tap. The first annual Carbondale Brews and Bread Fest Presented By Sopris Liquor & Wine, held Friday June 1st and Saturday June 2 at Third Street Center and PAC3 in Carbondale, CO. The Bread and Brew showcases the art of home brewing, the choices of craft breweries, the fragrance of community bread baking and the creativity of music and puppetry surrounded by renewable energy options and a mother of all mountains called Sopris. There will also be live music each day. Around 16 breweries will be pouring at this festival. Cost: $45 - tix go on sale in April and will sell out quickly. The OB Blues Bus will be available to shuttle ticket holders between Boulder & Longmont the evening of the event. Please meet the bus at the east of of the Safeway parking lot on the corner of Broadway & Diagonal Highway. The bus will arrive at 4:45pm & depart for Oskar Blues in Longmont at 5:15pm. The bus will return to Boulder a half-an-hour after the dinner is over. Enjoy 5 different Upslope Brewing beers paired with 5 delectable courses. Tickets at Evenbrite. Denver Botanic Gardens is excited to bring back their Garden Grapes & Hops event – a fun summer party featuring food, drink and live entertainment. Spend an evening in the Gardens' natural beauty with your friends at Garden Grapes & Hops. Due to the nature of this event, no one under the age of 21 will be permitted into the event. This includes infants. In conjunction with International Chili Society, Snowmass Village hosts two chili competitions, the Hot Times Regional Chili Cookoff and the Sizzling Snowmass Regional Championship, in addition to a salsa competition. Come on out and vote for your favorite chili in the Peoples Choice Chili Cookoff! Meanwhile, 30 brewers from around the globe face off in the prestigious “Snowmass Summer Ale” competition for their seasonal brew on Friday, followed by a Grand Tasting for a sampling of their latest & greatest on Saturday! Take the FREE Snowmass Village Shuttles to the event once in town. Cost: $25 general admission before June 9th, $30 at the door, $50 preferred seating. Listen to a huge selection of blues entertainment over two days. Outdoor beer garden during the event in downtown Greeley. More of a music fest than a beer fest but that shouldn't stop you from enjoying the blues with a local brew. Cost: $100 VIP includes preview and post parties, $75 regular at door, $60 Adult regular advanced, $55 Adult Members, $30 designated driver (soda/food only). Denver Botanic Gardens is excited to bring back our Garden Grapes & Hops event – a fun summer party featuring food, drink and live entertainment. Come spend an evening in the Gardens' natural beauty with your friends at Garden Grapes & Hops. Due to the nature of this event, no one under the age of 21 will be permitted into the event. This includes infants. 11+ breweries, 2 wineries, 2 distilleries, dozens of restaurants will attend. Tickets and info on the website. What happens when you mix a warm summer afternoon, ice-cold draft beer, and some fun, funky music? You get the South Pearl Street Music Festivals. Inaugurated in 2007, the brainchild of a South Pearl Street merchant, the first Blues & Brews debuted on August 11th on the 1200 block of South Pearl Street. Entering its fifth year, the music festivals have become a neighborhood tradition and a real shindig. Held on the second Saturdays of June, July, and August, this year’s series includes a new genre, jam music and has been affectionately and respectfully nicknamed South Pearl Jam. The question remains – is it a music festival with really good beer or a beer festival with really good music? Cost: $25 advanced, $30 day-of. Burning Can is Back and better than ever. Burning Can is a festival celebrating craft beer in a CAN! This year, we’re teaming up with Lyons Outdoor Games & the Colorado Brewers Guild to bring you entertainment for both you and your taste buds. Lyons Outdoor Games is a world-class celebration of mountain sports. The event was created 11 years ago as a fundraising vehicle for the Lyons Department of Parks, Recreation & Cultural Events. In addition to a full compliment of kayaking, biking, fly fishing, chainsaw carving and dog events, the 2012 Games will feature numerous clinics & exhibitions put on by some of the world’s most elite professional athletes… in addition to the newly added CANNED beer garden, Burning Can! Cost: VIP: $75/day or $140 weekend includes everything, General: $5 before 3pm, $10 after 3pm includes entry & music but not food, drink or rides). The Taste of Fort Collins (TFC) is a Northern Colorado Tradition - a community celebration with family-friendly activities that are perfect for the Northern Coloradoans’ active lifestyle. TFC continues to benefit Special Olympics Larimer County and Kiwanis Club International. This two-day festival offers attendees food from local and national restaurants, entertainment from regionally and internationally acclaimed musicians, and an eclectic display of fine artisans work as well as the region’s best crafters. New this year - a Craft Beer Pavilion and a Home Brew Competition in addition to the Wilbur's Wine Pavilion. Cost: If you have to ask you can't afford it. (Seriously) - Over $1000. Their 30th year! OK, so this isn't a beer event, but they do have daily Beer & Food Pairing seminars sponsored by Stella Artios. For wine enthusiasts, this is one of the biggest events of the year, but only if you can afford it. Wine, food, seminars, ritz. Rub elbows with the 1%'ers. This event is sponsored by Golden City Brewery - Celebrate the official start of summer with their annual fundraiser at Clear Creek History Park. Spread your blanket on the natural hillside amphitheater and enjoy a variety of toe-tapping live bluegrass and folk music. Beer, food, and other refreshments will be available for purchase. Proceeds help benefit Golden museums. June 16, 2012 (Saturday) - CANCELLED! Silverton's summer beer fest! There will be 9+ area breweries participating. $30 gets you unlimited beer tastes & glass. Plenty of great music. To benefit the San Juan Country Historical Society. After party at the Silverton Brewery at 7pm. Fest at 1333 Greene, Silverton, CO. If there is only one Great Divide event you attend this year, this should be the one! They'll open up the brewhouse, taproom, patio and close off the street to throw a big bash to celebrate 18 wonderful years of beer-making. Entry fee includes beer, special release beers, Live music from 5 bands, and one food ticket. Additional food may also be purchased from 5 food trucks. It's the hottest party of the year! Lou's Food Bar - 1851 W. 38th Ave.
Take Dad out for a beer dinner! Lou's will be offering up 4 courses paired with a different Upslope Brewing beer. Courses include: Hamburger sliders, Pertzel-wrapped Pheasant Sausage, Beer-braised Pork Ribs, and Cherry Pie with Orange Creamsicle Ice Cream. Call for more details and to reserve your seat. (303) 458-0336. Russell's is preparing a 4-course meal featuring the beers of Avery Brewing Company. A meal not to be missed. For details contact Russel's Smoke House at (720) 524-8050. Haggan Aviation Terminal - 12420 E. Control Tower Rd. Cost: $50 each or $90 per couple. Join in for a live wine and beer tasting to benefit the Foundation Fighting Blindness. Taste from a variety of craft beers and wines, appetizers, a silent and live auction. Beer tasting sponsored in part by Strange Brewing Company, Dads and Dudes Breweria. Join in the fun at Choice City Butcher Shop on Wednesday, June 20th for a Beer Dinner you will not forget with Great Divide Brewing. You will be welcomed with a social beer as they begin the night... then 4 different specialty beers matched with 4 courses. Tickets are 55 dollars and have limited availability. Tix may be purchased at Choice City. Beer social starts at 6:30pm and dinner being served at 7pm. Join in for a party filled with great food, drink and entertainment. Take a summer stroll in your best cocktail attire while you sip on beer and cocktails, dine on creative cuisine from some of Denver's best restaurants and enjoy the area's finest live entertainment. It's an annual "can't miss" event. This is a 21+ event only - sorry no kids. Rain or shine. Come to a special 4-course dinner featuring some excellent food selections paired with beers from Trinity Brewing Company. There will be assorted brats and sausages, cheese fondues, assorted meats and a chocolate and Baileys fondue at the end. Don't miss out. RSVP at the Melting Pot - (719) 385-0300. Time: Train leaves at 9:30am. Cost: Ranges from $69 to $169 - depending on ticket class. 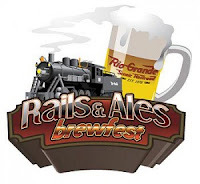 Ride the rails to a remote mountain location to sample beers from over 25 regional breweries. Enjoy live music on their unique boxcar stage with festival vendors (including a delicious western BBQ) in a surrounding mountain meadow. Don't wait to buy tickets, this event sells out fast and the 4th annual Rails & Ales promises to be the best yet. Ticket includes round trip train ride, access to the brewfest and a commemorative beer glass. Must bring I.D. and be over 21 years of age to receive a alcohol access wristband. There are seats fro 650 people this year and it's bound to sell-out. Cost: Beer tasting $30, Music afterwards is Free. Back for another year, the Summit of Bluegrass and Brews will return to Marina Park in Dillon, Colorado on June 23, 2012 with over 25 Colorado breweries. During the beer tasting event from 1:00-5:00, enjoy live music by Marty Jones and the Great Unknowns. Tickets to the unlimited beer tasting cost only $30 and benefit the Colorado Brewers’ Guild and the Dillon Business Association. Food vendors will be on site with lots of tasty options. Following the beer tasting, move down to the Lake Dillon Amphitheatre for a great, FREE concert with the David Grisman Bluegrass Experience! David Grisman has played with Jerry Garcia, Peter Rowan, Bonnie Raitt, Doc Watson, and other renowned artists. His music is a mix of bluegrass, folk, jazz, and international sounds – this is definitely a show you don’t want to miss! Cost: Advance $20, $25 at the gate (includes 10 tasting tickets), extra tickets $1 each (4oz). Great beer, food, live music and fun! Nearly 40 unique Colorado breweries will be pouring over this weekend with over 60 unique beers. It's a fest dedicated to beer lovers of all kinds! The Colorado Brewers' Festival is made up solely of Colorado Breweries, including nine host breweries from Fort Collins. It's Fort Collins' biggest beer festival of the year! Tickets on sale since May 11th, 2012. Live music across 2 stages all weekend long. Tons of food venders will also be at the fest! Details at: downtownfortcollins.com or call (970) 484-6500. After its inaugural year in 2011, this event is perfect for bacon lovers. The event takes place in Keystone's River Run Village, showcasing bacon related culinary creations, demonstrations and live music, this is an event that has been embraced quickly. Beer is available at a separate cost. Cost: Just ride your bike there! Building on the success of last year, the 4th Annual Cactus Bike From Work Bash presented by Primal will once again be an evening of two-wheeled delight at the Cactus offices at 15th & Little Raven – a perfect stop for commuters, located next to Confluence Park, the Platte River and Cherry Creek trails, and just minutes from Union Station. The event will feature free beer, food, entertainment and a chance to party with Denver’s diverse bike community while supporting the work of BikeDenver. Left Hand Brewing - 1265 Boston Ave.
Left Hand Brewing Company is proud to announce the Dark Star & Cold Brews benefit concert, this Friday, June 29th from 7-11pm featuring the premier Grateful Dead tribute band, Dark Star Orchestra. Proceeds from the sales of tickets, beer, food, and merchandise will benefit the Northern Colorado Chapter of the Red Cross and the Rist Canyon Volunteer Fire Department. Dark Star Orchestra’s previously scheduled event at Mishawaka Amphitheatre of Poudre Canyon has been relocated to Left Hand Brewing Company at 1265 Boston Avenue in Longmont, Colorado. With support from DSO and Shaped Music, Left Hand has rallied to transform the cancelled concert to a night to give back to those afflicted in the High Park Fire. The $35 tickets for the benefit concert will be available online until 8am June 29th, at which point tickets will only be sold at the door. All tickets already purchased for the Mishawaka event will be honored at the new location. Any tickets sold that fans wish to have refunded, will be handled by the Mishawaka box office. This is an all ages event and children under 10 are free. Stay tuned for more June events - more events added daily! - May 2012 Colorado Beer Festivals Calendar. - July 2012 Colorado Beer Festivals Calendar. - August 2012 Colorado Beer Festivals Calendar. - 2012 Colorado Beer Festivals & Events Calendar.